Shin Megami Tensei Wallpaper: Let The Battle Begin! Minitokyo »	Shin Megami Tensei Wallpapers » Shin Megami Tensei Wallpaper: Let The Battle Begin! Hello there once again and I'm back with another brand new, hot right out the oven wallpaper. And this time it's another Persona series wallpaper, since my last got some good feedback and etc.. I thought why not. Also The Persona 4 Arena game is on it's way in August, so I thought why not? Also since I haven't done one in a while. I thought this would be good to show. This took me about 6-8 hours to do. I say the hardest part was trying to figure out what I was going to do. I had really no clue, all I know is that I wanted to make a new wallpaper with the image in the link. 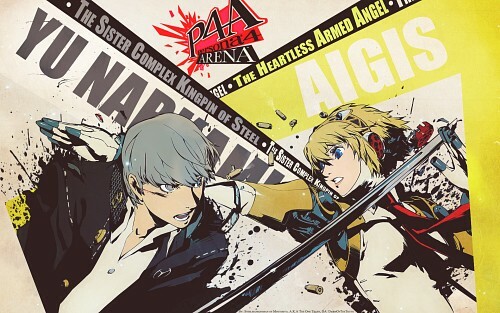 There are two versions one with the Persona 4 Arena Logo and one without it. I had a lot of fun making this and I hope you guys enjoy it. Browse Shin Megami Tensei Gallery: Recent | Popular. It's always nice to see Persona get some love, and I have to admit this is one of my favorite scans of the series. While I really like the concept you've got going on, it definitely needs more refinement. First off, I like what you did with Aegis/Aigis's name. I like the yellow background for it and the way you gave it an angle. However, with Yu, you've got this boarder on the bottom. Was that intentional? I can understand with such a similar color pallet of wanting to give some difference, but it's a bit off setting. I'd also recommend to keep going with that. Perhaps you could do something like when the party does a joint attack on downed or stunned enemies. It's sort of what I see this as, but as of right now it just feels a bit too lacking. It's also a bit offsetting, because the scan itself has this texture to it that's absent from the background, so it would be nice to see a bit of a continuation on that. Honestly, I really like this wall but it feels unfinished in it's current state. It's such an incredible scan and I do believe it should do all the speaking, but at the same time it needs a bit more oomph to it. 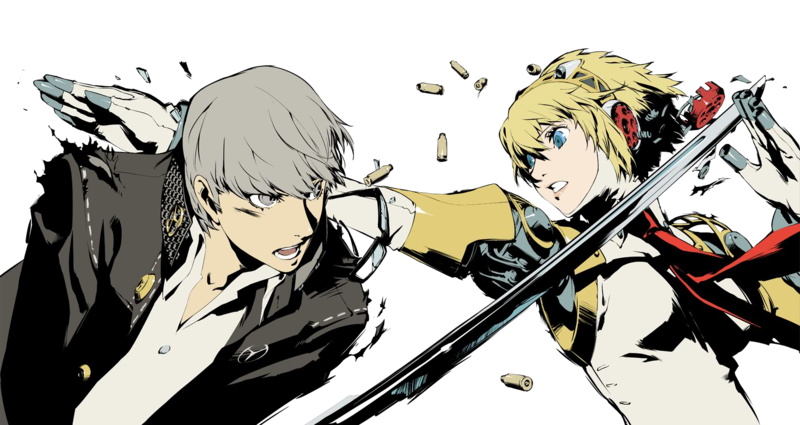 I'd also HIGHLY recommend offering much larger resolutions, so those of us with widescreens can at least crop it and use it as a background ; D.
Cannot wait for P4Arena and P4Golden. Quote by CyanideBlizzardIt's always nice to see Persona get some love, and I have to admit this is one of my favorite scans of the series. I agree with you, I do plan to update this, since I really do enjoy this scan and really wanted to make it pop. Yu was intentional, as you said the color really were too close. I so I needed it to show it a bit I tried to make it less off setting as I could. That way it could be seen yet not seen get it? I thought about added more lighting effects and different things. But then I'll just make a lot of versions over, and over. Get why to obsessed on making it as perfect as I could and make flaws. Well I thought of that have the other cast of characters somewhere in this. But the scan and the images I found of could of found won't fit well. Because the art style is different, But I could try and update it. I could make the image resolution higher but the image itself is about 1600x800 I believe cropping it higher wouldn't be so great for the overall image quality. Otherwise I would have done it by 1900x1200 or so. I like Persona series...and I'd like to say that you did a great job! Thank you for the new widescreen version. Very retro and vintage. I love this! I haven't seen Persona series, but I love your wall.